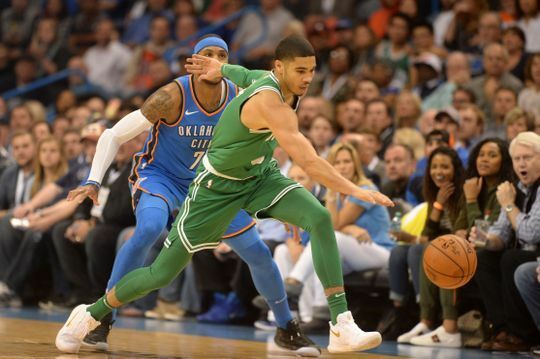 The Boston Celtics completed a furious comeback on the road against Oklahoma City behind huge performances from Al Horford and Kyrie Irving as they knocked off the Thunder for their 7th-straight win, 101-94. Both Horford and Irving came up huge late, with Al going 4 of 4 from three in the 4th quarter and Irving showing off his ridiculous handle getting to the rim at will in the 2nd half after a poor shooting performance in the 1st half. Irving finished with 2 points on 10 of 22 shooting to go along with 6 assists and 5 rebounds. Horford did a little bit of everything per usual, but his efficiency on the offensive end was off the charts tonight as he finished with 20 points on 8 of 10 shooting, including going 4 for 4 from three when the game's outcome was in the balance late. Jaylen Brown finished with a double-double tallying 10 points and 12 rebounds in 31 minutes. Paul George led the Thunder with 25 points on 9 of 20 shooting and he pulled down 10 rebounds as well. Carmelo Anthony had 10 points and 14 rebounds but had an atrocious night shooting the ball going 3 for 17 on the night. Russell Westbrook also finished with a double-double on 19 points and 11 assists although he struggled from the field too (35% shooting). After the first timeout midway through the opening quarter Marcus Morris checked in for his first action in Celtic green. His shot was a little off, as he missed his first three attempts from the field. George carried the load for the Thunder in the opening frame, scoring 10 points on 4 of 6 from the field, and OKC as a team shot a combined 52% from the floor (50% from 3) in the early game. With the Celtics offense rather stagnant early Brad Stevens decided to roll out an interesting lineup with three point guards (Irving, Rozier, and Smart) along with Daniel Theis and Tatum to try and get the ball moving. That experiment featured limited success and the C's found themselves on the wrong side of a 10-2 run shortly thereafter. The reigning MVP led the way on offense for OKC in the 2nd. Westbrook finished the first half with 12 points, 7 assists, and 5 rebounds but it was the Thunder defense that had the Celtics on the ropes at the break. Steven Adams cleaned up the glass with 9 rebounds, notched a pair of blocks, and had 6 points on 3 of 4 shooting at the half. HALFTIME: Thunder 55, Celtics 37. The Thunder's defense is eating Boston's offense alive. Stevens looked to jumpstart the offense again in the 3rd, putting Morris out with the starters to start the 2nd half. The C's answered this time, chipping away at the Thunder lead as they cut it to single digits after a pair of threes from Brown and Irving with 4:29 in the 3rd. Kyrie went full Uncle Drew at the end of the 3rd, scoring 9 points of an 11-2 C's run. Down 18 at halftime the C's found themselves within 4 at the end of three, 71-67 Thunder. The C's managed to finally knot up the score at 79 midway through the 4th behind a three from Ojeleye, and just one possession later they took their first lead since the opening minutes of the game after a corner-three from Horford. Then a crazy quick 5 points from Irving and suddenly the Celtics find themselves up 87-81 with 4:13 left in the game. Horford was an absolute killer from deep in the 4th. He knocked down his 4th straight straight three with 41.1 to play in the game and put the C's up 6 in the process. Irving and Horford combined for 26 points in the 4th quarter and that was more than enough to put away the Thunder. This was a terrific showing for the C's on the road. After struggling early, they rallied back from 18 down to knock off the superstar-loaded Thunder in Oklahoma City to punch off their 7th straight win, which has them donning the best record in the NBA.